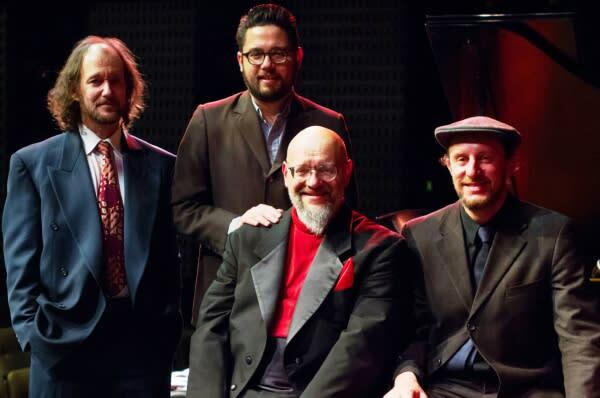 Dr. Roberto Gonzalez teams up with the Keith Saunders Jazz Trio from San Francisco to re-create a cabaret atmosphere on the college's Main Theater stage. Gonzalez has searched through the treasury of American songbooks to put together a melange of classic tunes in One For My Baby: Frank Sinatra and the Art of the Saloon Song. Before America became suburban, every downtown neighborhood had at least one bar or saloon, where customers could vent and recuperate. From the 1930's through the 1980â's, by many measures, Frank Sinatra was the greatest living performer of songs about love and love lost. The songs were composed mostly for performances in or about saloons. This concert revisits the stories of men and women, unhappy in love -- perhaps talking with bartenders -- at saloons. Among the masterpieces to be heard are One For My Baby, Angel Eyes, You Donâ't Know What Love Is, and The Man That Got Away.